DeWalt Sawzall - cutting technology at its best! If one is thinking of home renovation for setting up new windows, the DeWalt Sawzall is a must-have indeed! 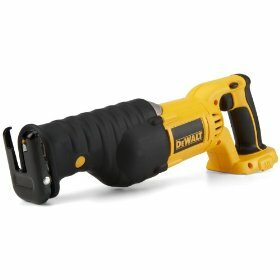 The Sawzall is an electric hand-held reciprocating saw. It is a very powerful saw and hence finds its application mainly during demolition and construction drives - for cutting pipe, ripping the floor or the ceiling or snipping off the studs inside the walls. This Sawzall has a jigsaw like big blade along with a handle. Dressed in yellow and black, they offer good designs which vary in power, speed and features. The models have variable speed, achieved through trigger sensitivity or through a dial providing increased control. The orbital action of these saws allows felling of wood at a faster rate. These saws have a reciprocating action by travelling up and down in motion (perpendicular) while the tip of the blade goes back and forth. All DeWALT comes with a 3 year Warranty and 1 year service contract and this is a blessing for customers. All models have an accompanying casing along with the manual. 1. DW303MB: This is powered by a 9.0amp motor. This model is capable of making 0-2400 strokes in a minute and is quick in cutting. 2. DW304PK: DeWalt Sawzall DW304PK is one of the best available Sawzall in the market because of the 4 position blade clamp. The four positions allow flush cutting and thus greater versatility. This Sawzall comes with a 10.0amp motor, making it even better for your needs in a heavy duty application. This model produces 0-2800 strokes per minute. The models DW 303MB and DW304PK have the lever-action keyless clamp which facilitates to fit the blades without touching it. Both the models have variable speed control achieved through the trigger action. In the DW310K model and DW311K model the stainless steel blade achieves keyless clamp (changing blades without touching), providing good dependability. The models DW 310K and DW 311K can easily adjust the depth of the cut with the keyless adjustable shoe. This also is helpful in extending the blade life. 3. DW310K model: Powered with a 12 amp motor this delivers between 0-2700 strokes per minute. The variable speed action is achieved through trigger. 4. DW311K - this model Sawzall DW311K takes cutting to the next level. It is powered by a 13 amp motor which is the highest in this level. It makes orbital action which delivers fast cutting for wood applications. Along with the Keyless clamp and Keyless shoe advantage, the anti-slip comfort handle is a boon since it gives stronger hold with increased comfort. The variable speed control is achieved by both trigger and dial. To add to your cutting accuracy, all models have a longer 1-1/8" stroke length. Durability of the whole machine is taken care by the set ball and roller bearings ensuring longer life and efficient cutting. The DeWalt Sawzall is a great plumbing friend working as the best domestic use electric powered reciprocating saw. Return From the DeWALT Sawzall Page to Home - Finishcarpentryhelp.com.